Aquarium biologists and rescuers reported to Boston Harbor this morning to identify a large marine animal carcass floating near Black Falcon Cruise Terminal. 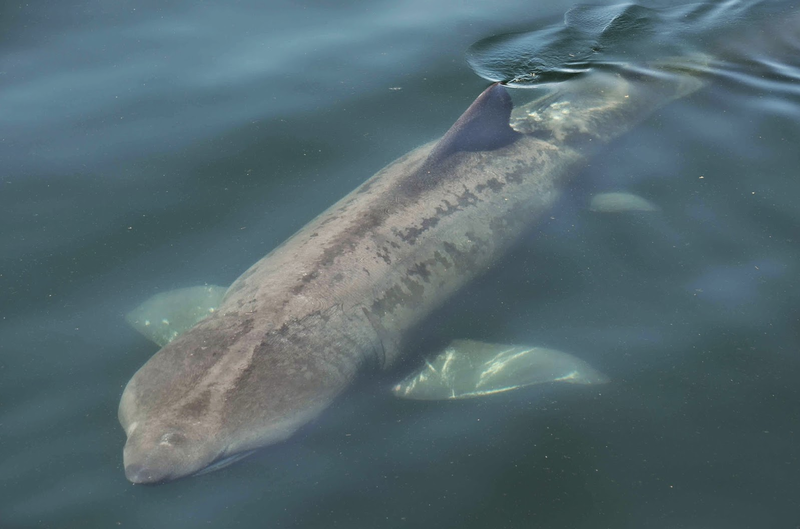 The decaying animal turned out to be a 24-foot basking shark, a harmless plankton feeder that had been pushed into the harbor on the bow of a container ship more than two weeks ago. 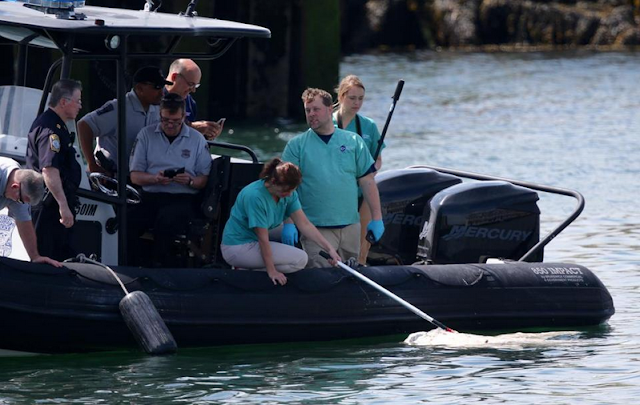 Adam Kennedy and other members of the rescue team examine the shark carcass from a police boat. Only a small portion was accessible at the surface with most of the body descending vertically into the Reserve Channel’s thirty-foot depth. While the animal was very decayed, it was easily identified by its size, the cartilaginous fins, and the array of gill rakers, which help the sharks filter plankton from the water. The biologists were unable to determine a cause of death. It's possible the animal was dead before it was struck by the ship. File photo of a basking shark photographed on a New England Aquarium Whale Watch in 2014. Knowing that the carcass was a shark and given its length, there was only one local shark species that it could be, not the great white, but the plankton feeding basking shark. Basking sharks are the second largest fish in the world and a frequent visitor to New England waters in the summer months. They migrate to this region in early April to feed on plankton. Passengers of New England Aquarium Whale Watches can sometimes see these sharks gliding along the surface of the water gulping the nutrient-rich water. Many times, their dorsal fin breaks the surface and causes a stir —shark! But here's a quick resource to help tell the difference between a harmless basking shark and their relatives the great white shark. The submerged carcass was allowed to exit the Reserve Channel into the harbor where it will likely settle on the bottom shortly creating a feasting oasis for all kinds of marine animals.